This week I'm trying to bump up my posting to twice a week! I'll still be having my regular Saturday post go up (it'll be something random, like usual), but I'm shooting for Tuesday's posts to be a top ten type post where I share ten things I'm loving or thinking or doing. It could be funny videos, my favorite songs, interesting articles...anything! 1. I have loved reading this book lately! I'm about halfway through, and I'm dying to get to the end so I can have my (hopefully) happy ending with it. 2. Sometimes you just need to try something new, so I keep this Pinterest board close to hand so that on weeknights when I need a side dish I can whip something up quickly. I want to try this and this sometime this week. 3. Sarah shared this over on her Friday Favorites post and I loved reading it; it's a Southern Living article all about Southern Hospitality. 4. This Facebook video is SO cute; it reminds me so much of my lab, Forrest. 5. If you're a blogger, you need to see if you're a "no-reply" blogger! Sarah (who also shared #3 on this post) helped me out so much by telling me that I've been "no-reply" for no telling how long. Thankfully, the girls over at the Millennial Blogger Network really helped me get things straightened out; especially this really helpful post by Caro! If you blog, go check out her post & make sure your blog is working properly. 6. Lilly Pulitzer's new line recently released & I'm dying over this piece, but if Alabama decides to stay the temperature that it's currently at I might need to wear this instead. 7. Y'all, if you haven't watched Santa Clarita Diet on Netflix yet, you're seriously missing out. I love Drew Barrymore so much & although I don't normally love comedies (I'm more of a drama girl), I love this show. It's so funny & the episodes are short so it's easy to watch. 9. Okay, I don't usually like Sam Hunt's music but this songreally makes me just want to go driving around with my windows down. It's so darn catchy. 10. I recently saw someone talking about these jeans and I couldn't believe that Topshop even carried them...thoughts? 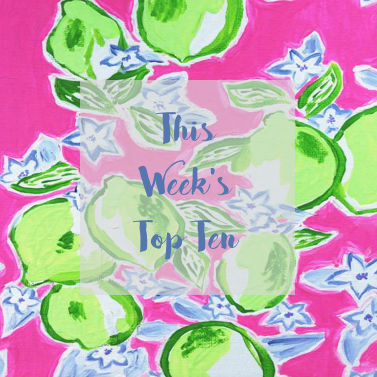 Let me know what you think about number ten (or any of these top ten!) below! The Santa Clarita diet is so funny! It is a great show! This is a super cute round up to let people in on what you're thinking and doing. I had spring break last week and went back to school on Monday! We had a snowstorm yesterday, so school was canceled, but transitioning back after having a week off is still hard. That no reply post was super interesting! Good to know for friends in teh future! I love that you make these lists! they're super cute! Yes to all of this!!! I also just started watching the Santa Clarita Diet on Netflix... too funny! I love this list and the idea of having a weekly top 10. That Sam Hunt song is super catchy and makes me ready for warm summer days!